I think that this quote can particularly apply to sports fans: we don’t remember games; we remember moments. It’s tough to remember games when there are 162 of them. For me, at least, sometimes they simply blend together just like days. Most of the time, it is particular moments in games that I remember. It could be a clutch, tie-breaking hit in the sixth inning, a walk-off hit, or even a particular strikeout. I suppose that recalling the context of these moments leads to remembering most of the game, too, but I really believe that it is the one particular moment that pervades the memory. Sometimes I remember particular games, but that pretty much only comes from exceptionally dominant pitching performances. I think I speak on behalf of all baseball fans when I say that my attachment to memories is far greater for games that I have actually seen in person. I think we all have a favorite game that we have been to, and this can be because of a particular moment, a particular performance, or maybe both. You might find it kind of odd when I say that the best pitching performance I have ever seen was thrown by a minor league pitcher at the Double-A level. That minor league pitcher was Kyle Weiland, who will be making his major league debut in about an hour. That game was even more special for me because I was writing the game story that night, and Weiland sure gave me some great material. I had never seen anything like it. After giving up a double in the first inning, Weiland retired the next 20 batters he faced. That was the only hit he gave up in his seven innings of work. His command was impeccable as he struck out eight batters, walked none, and threw 63 of 90 pitches for strikes. It is, without a doubt, the best pitching performance I have ever seen. Period. I had the pleasure of interviewing Weiland the very next day. I had been hoping I could interview him at some point during my time at Portland, so the timing was just unbelievable. E: I noticed your changeup working well last night, and you were getting a lot of outs with it. Is that your out pitch? E: SoxProspects describes your curveball as a “slurve.” Do you agree with that? How do you describe it? outing. Whatever comes up that day, that’s what I adjust to. E: I’ve seen so many pitchers make a bad throw to first, why do you think that is? Weiland has been particularly impressive this season with Pawtucket. In his 93 innings of work, he has given up 69 hits, 37 walks, and he has struck out 99. He has an ERA of 3.00, which is a significant drop from last year’s 4.42 in Portland, and even Salem’s 3.46. He is striking out 9.6 batters per nine innings this year, and has an impressive WHIP of 1.14. Weiland is my favorite pitching prospect in the organization right now, so I’m really excited for him. I don’t think there’s any doubt that his statistics warrant a call-up. I don’t know if he will stick with the club at this point though, but it’s always good for him to get his first taste. The only reason I wouldn’t want him to stick is if he isn’t going to get the innings he needs. In the future, however, there’s no doubt in my mind that Weiland should be a part of the major league roster. 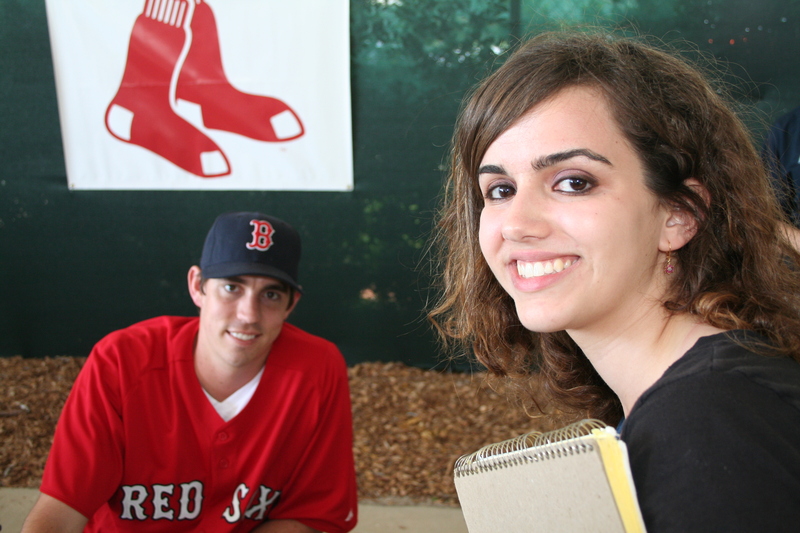 For extensive scouting reports on Weiland, check out SoxProspects. Opening Weekend: they were humbled. Lester, Lackey, and Buchholz when they left the ball up in the zone. just a matter of adaptation. doubt he will stick as a major-league pitcher. After a sweep, it’s easy to focus on the negatives, but after the first three games of the season, it’s almost futile. I took two things out of this weekend: Adrian Gonzalez hitting to all fields, and David Ortiz’s hot start. Ortiz’s slow starts over the past three seasons have been grounds for a lot of scrutiny, but this year, he subtlety asserted himself in an otherwise disappointing weekend. As I said before, many say that more than half of baseball is mental: this applies to recovering from tough innings, slumps, sweeps, and more. Hitting a 95 mph fastball is one thing, but maintaining confidence in your mechanics and yourself after striking out three times in a game is another thing. Baseball is all about focusing on the present, and moving on after a tough at-bat, day, or series. The Red Sox came into the 2011 season with a lot of expectations, but expert analysts have been predicting them to win the World Series for years because every season, Epstein puts together a World Series caliber team. But expectations are intangible, and they do not always materialize into the tangibility of positive results. I don’t think anyone predicted that the Rangers would sweep the Red Sox in the opening series. This series is indicative of baseball’s unpredictable nature, and it made a lot of people realize that the Red Sox aren’t invincible. Vulnerability is the essence of humanity: They are prone to error and to failure because they’re playing a sport that fosters it. I don’t think the Red Sox ever sought invincibility; rather, they seek some degree of immortality. They have a fantastic lineup that could transcend baseball’s generations. However, baseball is a team sport, and a team is only as strong as its weakest link.